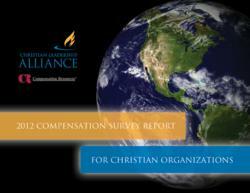 Compensation Resources, Inc. (CRI) and Christian Leadership Alliance (CLA) have announced that participation in the 2012 Compensation Survey Report for Christian Organizations will open May 1, 2012. This annual study is specifically designed to provide important compensation data for use by Christian-based organizations, specific to Not-For-Profits, Ministries and Churches. Along with salary and bonus data on 119 jobs, the survey also captures benefit information including insurance coverage, paid time off, retirement plans, turnover, work – life, etc. In addition, the survey we will report data for each position by revenue, employee size, entity, and region. Various statistical measures are reported, such as the average, median, and percentile data for each position. If you would like to learn more about the 2012 Compensation Survey Report for Christian Organizations, please contact Andrew Sellers at (877) 934-0505 x115 or ats(at)compensationresources(dot)com. A sample of the 2011 survey is available for download at http://www.CompensationResources.com. About Compensation Resources, Inc. (CRI): CRI provides compensation and human resource consulting services to mid and small cap public companies, private, family-owned, and closely held firms, as well as not-for-profit organizations. CRI specializes in executive compensation, sales compensation, pay-for-performance and incentive compensation, performance management programs, expert witness services, and custom surveys. Christian Leadership Alliance is the best source of information and insights on leadership, management, resource development and governance. CLA is focused on enhancing organizational effectiveness for ministries and large churches. We serve more than 8,000 individual members who are active in over 3,500 Christian organizations. CLA offers to its members a wealth of resources, including Outcomes magazine published quarterly, Resource Center, leadership training at their Annual National Management Conference, monthly one-hour interactive webinars, and twice monthly e-newsletters. In addition to these numerous resources and training opportunities, CLA has developed a strong networking community, demonstrated by its online Membership Directory, Career Center, and regional CLA chapters located in key cities across the U.S.
For more information about becoming a member, please contact CLA at (949) 487-0900 or visit us at http://www.ChristianLeadershipAlliance.org.